Jerry began his career in the metal roofing industry in 1976 initially working for a leading West Coast manufacturer of metal roofing products. In the mid 80’s he became the regional General Manager and Vice-President for this international firm managing the facilities and operations in the Pacific Northwest and was a member of the corporate Executive Committee directing the company’s activities in North America. 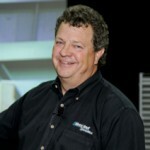 Jerry is a regular sponsored speaker, trainer and moderator at the annual Metalcon International convention and has also conducted training programs for the International Roofing Exposition. He has reviewed the Standing Seam training program for the Roofing Industry Educational Institute (RIEI) and participates with the Metal Roofing Alliance (MRA) as a resource for training and promotional direction. Jerry prepared and presented a specialized training program for a leading US metal products manufacturer within the metal roofing industry and has been engaged as an expert witness to assist in industry related litigation. In 2016 Jerry was inducted into the Metal Construction Hall of Fame. 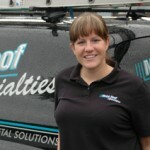 Haley Iselin joined the company in 2004 after graduating from the University of Washington. She has a genuine enthusiasm for metal roofing and all metal products and is continually looking for new ways to use them and inspire others to do the same. You shouldn’t be surprised to hear her say, “Why wouldn’t you use metal?” to anyone looking for a building material product. After several years of volunteering with the organization, in 2007 Haley joined the Rebuilding Together South Sound board of directors, served as President in 2012-2013 and currently chairs the RTSS Advisory Council. In 2008 she became part of the National Roofing Contractors Association Future Executive Institute and graduated from the 3 year program in 2011. She was recognized by the Business Examiner in 2011 as one of their 40 under Forty, and in 2012 by the Girl Scouts of Western Washington as a Women of Distinction. Recently Haley was selected as a recipient of the Metal Construction Association Triumph Awards, “2017 Industry Young Movers and Shakers”, which she considers to be a huge honor. Nita Earsly joined Metal Roof Specialties as a part time employee in January 2018 to manage all the bookkeeping duties. Nita has an extensive background in accounting work and has spent the last few years managing the books for many small businesses like MRSI. She is experienced in both construction and not for profit type operations and excels at finding more efficient ways of doing things. Nita is a lover of all animals, especially dogs and her cat Doris. Taressa Neal was brought onto the MRSI team in July of 2018 and quickly became an important part of the operation. Taressa’s background includes work in the construction industry, IT field, non-profit sector, and owning and operating a local bakery. Her knowledge extends much beyond her years in experience because she is a quick learner with an incredible ability to adapt to any situation. Taressa’s desire to understand all aspects of the business make her a perfect fit for this small team of “All Hats Wearers”. She may consider herself a Metal Apprentice now and will be a true Metal Master in no time. You may hear her welcoming voice answer your call or see her out on the forklift helping load a customer when you pass by. If you do drive by and see her be sure to give a honk and wave!